Outdoor enthusiasts in north Wales will be able to get safety updated on mountain conditions via Twitter – in two languages. The new feed will update walkers, mountaineers, climbers and mountain bikers when ground conditions change. The service, in Welsh and English, is being run by wardens from Snowdonia national park. 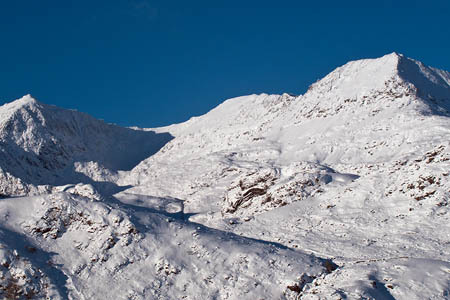 Gruff Owen, one of the Snowdonia National Park Authority’s wardens, warned that walkers should be prepared for winter conditions on the hills of the area. He said: “In the middle of all the Christmas excitement, it’s very easy to forget the importance of thorough preparation before setting out on the mountains, and knowing what the ground conditions will be is part of that preparation. “Although the views of snow on the mountains are stunning, you need to remember that snow is also deceptive. The most dangerous snow can look soft and nice but actually, if it has thawed and re-freezes, it is extremely dangerous on the ground. “You need to ensure that you have the correct equipment, including an ice-axe and crampons and knowing how to use them is as important as having them. Knowing also what the ground conditions will be before setting out is incredibly important. John Grisdale, chair of the Llanberis Mountain Rescue Team added: “This new service will be a valuable service to everyone who intends to walk on the mountains in Snowdonia. “Llanberis rescue team is called out too often to rescue walkers in bad weather because they haven’t bothered to look at the weather forecast and therefore haven’t prepared. Mr Owen and his colleagues already supply information the Met Office’s website. He is also responsible for the new bilingual Twitter service @eryridiogel in Welsh and @safesnowdonia in English. Syniad da.......a wasanaeth ddefnyddiol i mynyddwyr Cymru. Tybed gall mwy o wasanaethau fod yn y Gymraeg hefyd!